The big news at DJI’s “huge Seize the Moment” event in New York City is, as expected, pretty small. The world’s largest consumer drone maker cracked the code of portability with last year’s backpack-sized, folding prop Mavic Pro drone (soundly thumping former ally GoPro in the process) and now it’s back on the scene a little over six months later with the Spark, a palm-sized unit that makes the Mavic look downright massive by comparison. The usually top-secret drone maker did a terrible job keeping things under wraps this time out. Honestly, there isn’t much we didn’t see ahead of the event, save, of course, for actually getting to see the damn thing in the air. Leaks showcased the tiny vehicle from pretty much every angle — fitting, really, for a space that’s been raising serious privacy concerns of late. And they even got the name right. The drone starts at a surprisingly accessible $499. That was really going to be the big sticking point here — with most pundits considering anything under $1,000 a good play for the company’s generally high-quality but high-priced products. It’s still not cheap, exactly, giving the number of budget drones that have flooded the market in recent years, but with all of the functionality the company has jammed into the thing, the Spark could well be DJI’s first truly mainstream drone. The notion that this was going to be some kind of racing drone turned out to have missed the mark pretty broadly. Like the Mavic and basically all of the company’s drones, this is very much a photo/video taking device. 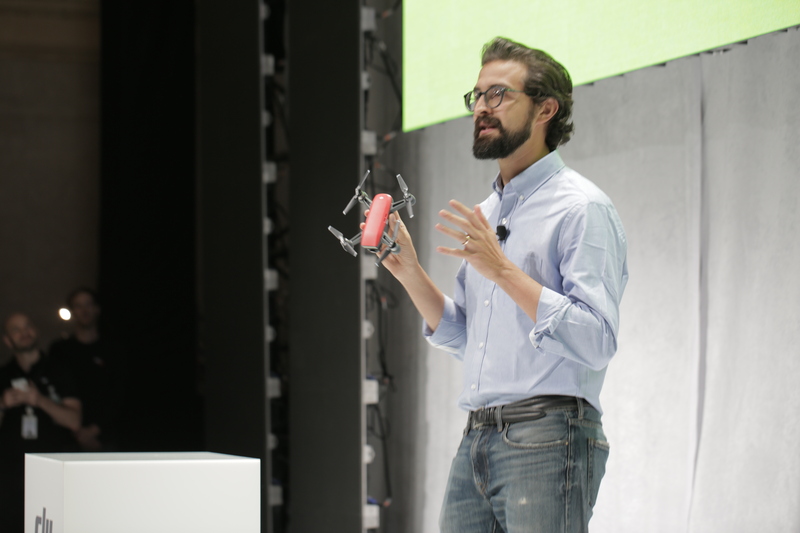 The company is positioning the drone as a “story-telling” product – a fact it hinted at with the recent teaser video it released a couple of days before today’s event. The company is essentially positioning this as the first drone you can really take with you and incorporate into your life — the same story it attempted to tell with the Mavic last year. But aside from size (which let’s be honest, is the most important thing here), the Spark’s got some pretty impressive tricks up its sleeves. It can take off from the palm of your hands and land back in it with little hassle. The demo of the functionality went exactly as planned, which isn’t always the case at these sorts of events, especially given the swamp of cell phone signals that is Grand Central Station. Even more impressive is a gesture-based control, about which the assembled press made audibly excited mumbled comparisons to Star Wars. And yeah, there’s a selfie function, too. Smiling with you arms folded will trigger the picture taking functionality. For more complex maneuvers, there’s a smartphone app that can be used to send the drone off in the air in various patterns, gathering some pretty impressive video footage in the process. And the company’s existing Go 4 app offers up quick video editing on the fly. The video looks pretty solid in the demos — it’s full HD, and the still camera is 12MP. So, no 4K, which, as you’ve no doubt guessed, means this is far from a professional device. It’s more like a flying smartphone. There are a number of photo filters on board as well, that add things like shallow depth of field to images. The drone itself can reach speeds of up to 31MPH, and a 3D sensing camera, GPS/Glonass and an on-board vision positioning system help keep the system stable, even indoors when the signal is crappy, while the two-axis gimbal helps stabilize video while it’s shooting. 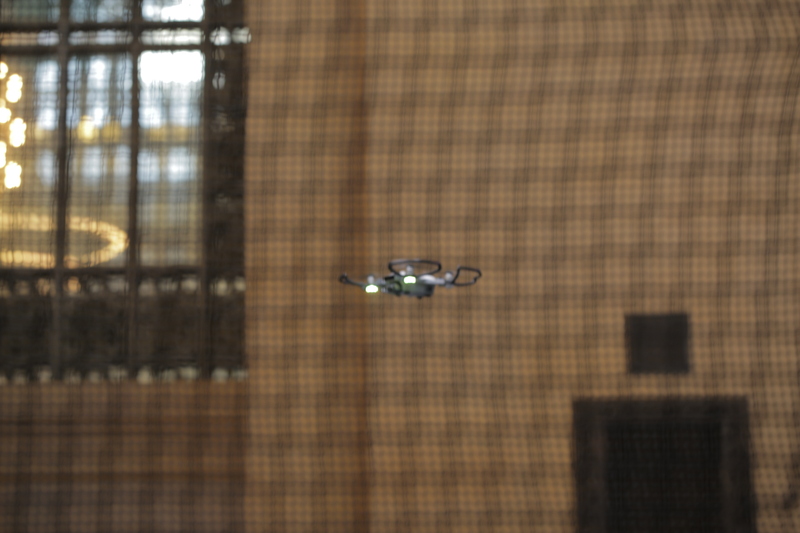 The on-board battery is swappable on the fly – a big deal for a drone this small. And, for good measure, there’s a microUSB port for recharging — not USB-C for some reason, but beggars can’t be choosers, I guess. Each battery promises about 16 minutes of flight time person charge. There’s also a remote for the drone. It’s an optional accessory, which explains why it wasn’t pictured in those original leaks. The tiny drone is available for pre-order today and starts shipping next month in three different colors. Assuming, of course, that the company doesn’t run into the sorts of production issues that plague the Mavic. There are a number of accessories available for the drone, a number of which are jammed into the $699 Fly More deluxe version. And the thing naturally works with the first-person video goggles that the company debuted alongside the Mavic last year. DJI also went big on the warranty this time out, after the Mavic ran into some issues with its own launch (not to mention our own birdhouse-related issues) and GoPro’s Karma started literally falling from the sky. Every time DJI announces a drone these days, the company makes the promise of finally mainstreaming the still relatively emerging technology. And every time the argument sounds a little more convincing. Last year’s Mavic backpack drone made a pretty compelling case, at least as far as getting more of these devices into the hands of photo enthusiasts. And the camera body-sized Spark is even more tempting for those on the go. With a palm-sized body and sub-$500 price point, the company is taking some pretty significant steps beyond just photographers and videographers. It’s still a pretty expensive toy at the end of the day. But with the number of features the company is tossing in here, the notion of a solid drone for the rest of us just became a little more real. We’ll be getting our hands on one soon, a fact that no one’s more excited about than our videographer.